Palestinian journalist Yaser Murtaja was killed by a butterfly bullet in Gaza (screenshot via aljazeera.com). At the recent Gaza demonstrations, 60 Palestinians were killed and over 3,500 received leg wounds from Israeli sniper attacks, suggesting an attempt by the Israeli Forces to prevent the democratic right of assembly, writes Ian Curr. THE PALESTINIANS have discovered their own long march — they call it the Great March of Return and it continues still. Estimates of people marching to the border fence during the marches vary from 30,000 upwards. I have been looking at the casualties that have occurred at the Gaza border from Land Day on 30 March 2018, till Al Nakba on 15 May 2018. By 15 May, more than 3,500 Palestinians had been shot in the legs, compared with 563 in the head and neck (surely an intention to kill). That is a very high casualty count in one part of the anatomy. What it suggests to me is an attempt to prevent the democratic right of march and assembly which forms the cornerstone of Western liberal democracy. Actions by the Israeli Occupation Government was to ban assembly. There is little doubt that Israel falls short on this democratic right, as it does on other criteria. People familiar with rifles may be aware of the calculation involved in such a strategy by the occupation forces. An Israeli soldier armed with either an SR25 or M24 rifle is capable of hitting a human target at 1,000 metres. His or her ability to hit a person at this range is increased by lowering the trajectory of the shot and aiming at the legs. This way, if the bullet misses its intended target, then it may well strike a person marching behind. Injuring the marchers rather than killing them outright places more stress on services required to sustain those injured people. It also extends the timeframe and burden on the remainder of Palestinian civil society. The tactics of the demonstrators are clearly to reduce casualties; they do so by burning tyres for covering smoke and using the landscape for protection. They keep low where possible. As a boy, I, like others, was a practised shot with a shanghai. On rare occasions, I used a slingshot; however my preferred weapon was the shanghai because of its superior accuracy. Neither device could deliver a projectile with any accuracy at more than 30 metres and to achieve more than 100 metres was well-nigh impossible. No doubt there are some who could do this. When confronted with a superior marksman, all you need do is retire to a distance out of range or where an accurate shot is less likely. I had the misfortune once of staying in range by hiding behind a tree and, just as I poked my head around the tree, my brother fired a lucky shot with his shanghai hitting me in the head. The scar remains to this day. I never made this mistake again. But these are not boys’ games. Common sense dictates that, in the field, such weapons are no threat to a soldier armed with a sniper rifle. This would be true even if there were no fences. All the soldier needs to do it is to retire to a distance beyond the range of the slingshots. 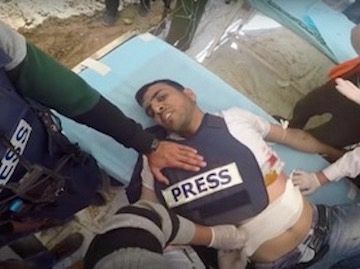 A butterfly bullet killed Palestinian journalist Yaser Murtaja on 6 April 2018. He is shown in the image above lying on the ground in Gaza while the deadly weapon destroyed his abdomen. The occupation soldier equipped with a magazine loaded with 20 bullets has no trouble shooting his opponents, even if they are 50 or 60 strong, long before they can get into range. Given this, why has Australia's Minister for Foreign Affairs Julie Bishop failed to censure Israel in the United Nations? Why can't she show a tiny fraction of the courage of the Palestinians under fire during the Great March of Return? "And if we are in any doubt, Mr Speaker, about the lethal incident of Israeli snipers working on the border, I’m afraid we only have to look at the wounds suffered by their victims." At least Labor Member for Grayndler Anthony Albanese came out against Israel’s murderous tactic of shooting demonstrators and press with live ammunition, and demanded to know why Australia has not voted in favour of a Gaza inquiry. Maybe Albanese will become Australia’s Jeremy Corbyn.